1 box LaBrea Bakery Corn Bread Stuffing with sage and thyme (can be purchased from Williams-Sonoma) Note: is you can’t find or they are out of stock of LaBrea Bakery Corn Bread Stuffing, use 4 cups cornbread crumbles and 3 cups biscuit crumbs, add 1 tablespoon sage, then follow the same instructions. on medium heat. Sautee the onions and celery until soft and translucent, about 10 minutes, add salt and pepper. Add butter, melt; add mushrooms and saute 3 minutes. Warm chicken stock in sauce pan, then add Cream of Chicken Soup, mix well with wooden spoon until soup is blended. 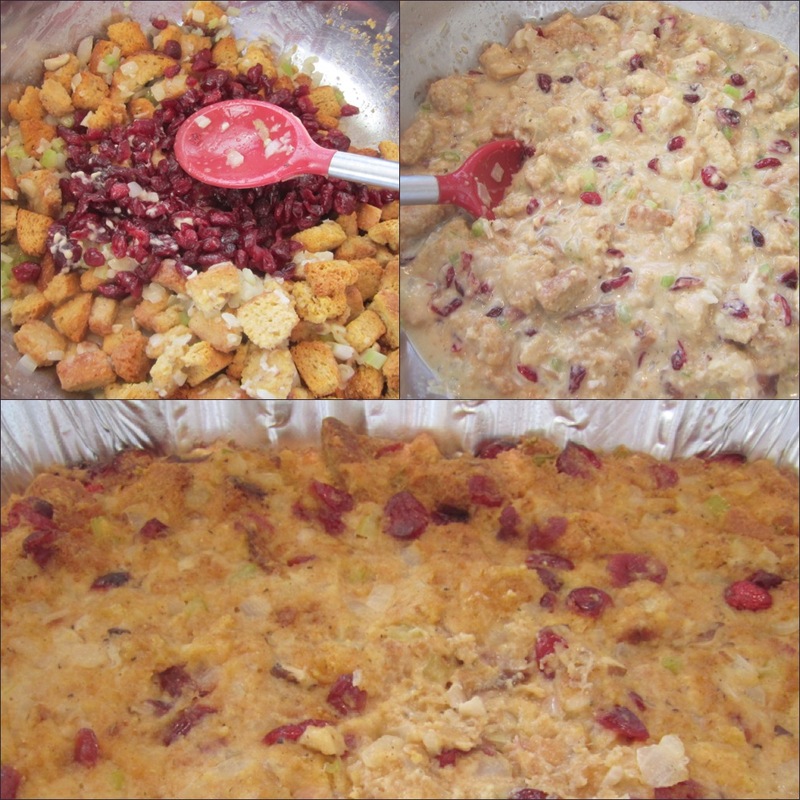 Place corn bread stuffing in large bowl. Pour onion and celery mixture over stuffing. Ladle chicken stock and soup liquid over cornbread stuffing mixture, one ladle at a time and continue mixing until all liquid is mixed with the stuffing. Let sit for 5 minutes for liquid to absorb, it should be very moist. 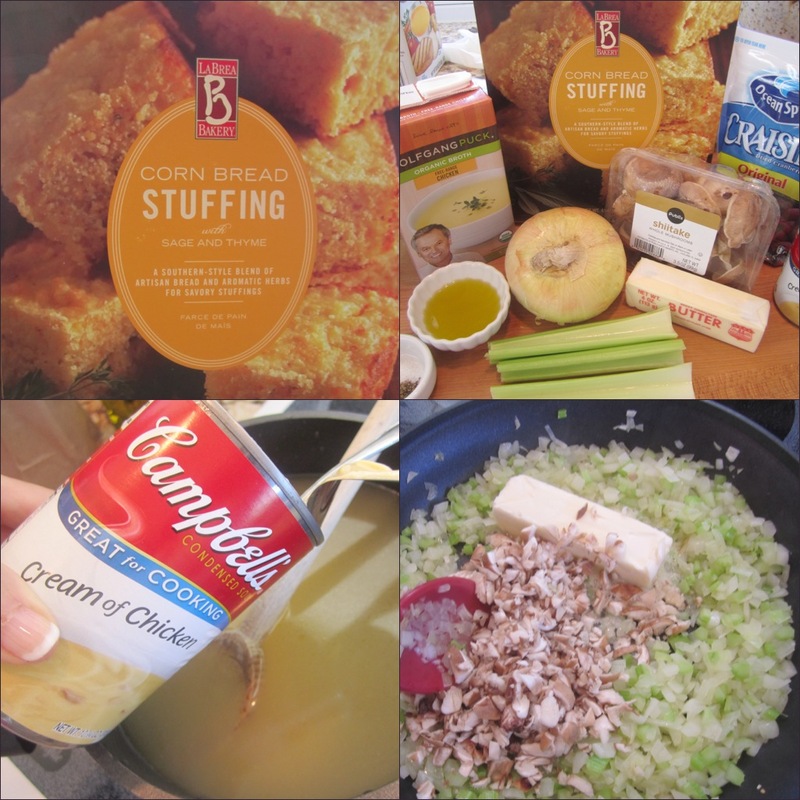 (If using the LaBrea Bakery Corn Bread Stuffing, use a potato masher to break up any large cubes.) Butter a casserole dish. Add stuffing, cover with foil and bake for 25 minutes. Remove the foil and bake for 35 to 40 minutes, until the top is golden brown. This entry was posted in Sides & Misc. and tagged cornbread, Cornbread stuffing, cranberries, dinner, Food, recipe, sage, STUFFING, Thanksgiving, thyme. Bookmark the permalink.